Welcome to the Sept issue of NEWSLETTER. Since the introduction of MSMA in year 2000; also based on our business feedback, we still encounter a number of engineers in country need further educate more on MSMA guideline. For example, What is the difference between onsite detention and detention basin? As we understand, one of the main important of concept of MSMA is to control at source. With this conceprt and by the implementation of MSMA in a project. It is "LIFE" job. In order to get it works, first of all, engineer needs basic understand of hydraulic and hydrology to adopt the concept of MSMA in a project. General knowledge also another important factor. Field experience is important. Then MSMA can comes apart. No doubt, there still have other elements are required in implementantion of guideline. The MSMA cannot just purely read through and memorize it. Therefore, it will be difficult to just direct adoption. Besides, we aware that with recent NATIONAL CONFERENCE ON STORMWATER MANAGEMENT AND EROSION AND SEDIMENT CONTROL at TH Hotel & Convention Centre Terengganu 18-20 Sept 2017. Our government bodies especially Jabatan Pengairan Dan Saliran Malaysia where strong support on implementation of guideline. Now there will be additional regulation in ESCP. Furthermore, it will covers another two states Sabah and Sarawak. As a result, it shows the important of the stormwater management in Malaysia. In order the promote further on the implementation, there still need a lot of effect from government on stormwater management. We have anticipte the important of the guideline. We know the problem of understanding the guideline. We know engineers need it. With years in water resources, we had gone through many discussion on MSMA topics with many water resource experts. Like pump and ESCP experts. We have eventually compiled and created a list of MSMA modules which direct built on top of MSMA chapters. We not no longer just cover quantity but now we also cover the quality sections. Until now, we have covers about 90% of the guideline in software. 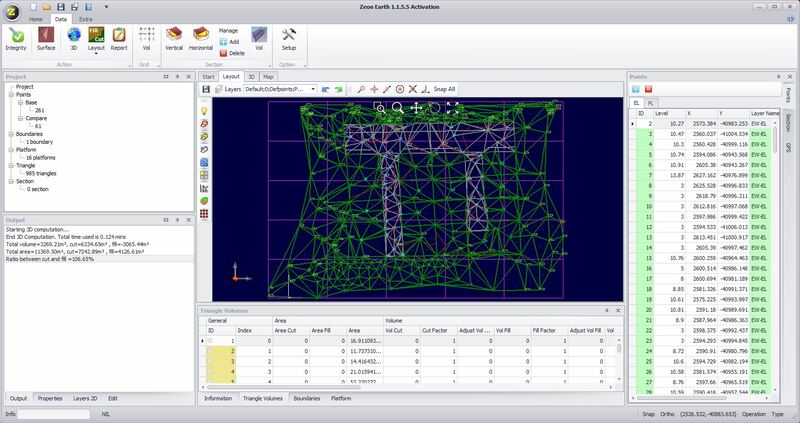 Now with our software on MSMA, engineers can more easily to understand by the interactive between software with user. Like our 3D view in certain modules. It provides best understanding on MSMA element look alike. Our calculation features give user even more clear how the computation is carried out. Besides, our comprehessive traning manuals provide another level of learning. The training manuals provide working example in manual computation as compare to computer output. If you are in active subscription, then you are even much easy to catch up MSMA concept to design through our support teams; where we are good water resource knowledge. We will further help you. As a result, we are strongly recommended these modules to user who want to learn and use the MSMA 2nd edition through software. We are here to present our MSMA software in term of chapters of Urban Stormwater Management Manual for Malaysia Guideline. It had spent more than 10 years in development of these software. In the early days, we just focus on quantity; mainly on detention basin and onsite-detention. As years go on, we know that other topics in MSMA eventually become a need. Such as ESCP. Erosion and Sediment Control plan. It will becomes an important topic in country. Total chapters in MSMA 2nd edition comprises of 20 chapters. We had covered every chapters of MSMA 2nd edition. Now we pleased to announ our list of products. Can use for design, checking, validation MSMA contents. Research on water resource topics on MSMA topics..
Training manuals with manual steps that come together with computer steps. 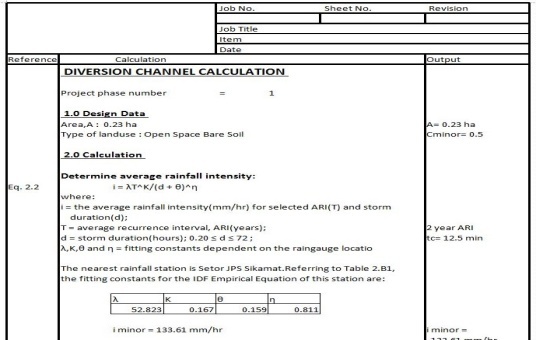 It covers topics of pollutant estimation such as water quality volume, load estimation and some BMPs. It includes three working MSMA examples in this topic. It covers topics of roof drainage system. It works from CAD drawing where user needs to import a roof CAD drawing into applicaiton. With predefine the layers for, roof catchment, roof gutter and downpipe. The application can works out requires gutter and downpipe sizes. It is useful for engineer who want to check any existing gutter size which may have predetermine by architect. It covers quantity topics as before. The main difference between the Storm+ is it is EXPRESS mode, xStorm run in full automation with a list of data entry. Automation of routing and check the final output. It comes with full report in EXCEL format. It covers quantity topics including chapter 1.0, 2.0, 5.0 and 7.0. It started from select rainfall station, then decide type of runoff by rational or time area method, then finally design the detention basin or OSD. It goes through step by step to build up the system. It is good for beginner to learn the process flow of detention basin. It covers topic of Chapter 8 Infiltration facilities. Two types of examples are covered Infiltration trench and basin. Here it comes with fully 3D view where the 3D view can be saved into CAD drawing. If client's office has CAD program that support 3D, this can use it to present to client by carrying the dwg file drawing to client office. It gives a clear understanding of how the shape of infiltration by 3D. It also comes with fully EXCEL look alike output. It covers topics of Chapter 9 Bioretention system. A module of impermeable bioretention system is built. 3D view is available for better understanding of system. 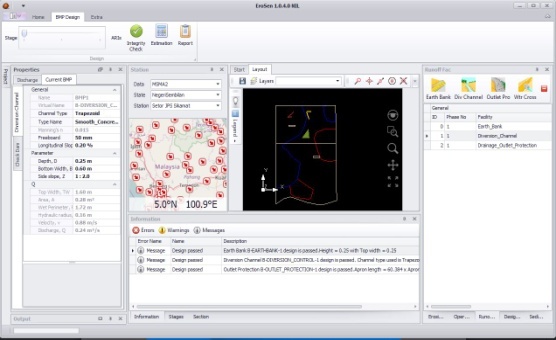 3D function is similar to InfilSoft. The output is in EXCEL look alike. It covers topics of Chapter 10 Gross pollutant traps. It provides three modules here. Trash rack computation, SBTR design and OGI system. All comes with 3D. Output is EXCEL alike output. It covers topics of Chapter 11 Water quality pond and wetlands. It provides two modules here. Water Quality Pond and Wetland design modules. All comes with 3D. Output is EXCEL alike output. One of our most anticipated software. It had compiled the content of Chapter 12 Erosion and Sediment Control Plan and Guideline for Erosion and Sediment Control in Malaysia by Department of Irrigation and Drainage Malaysia 2010. It has USLE and MUSLE modules. Plus all BMPs which descripte in MSMA Chapter 12. For the BMP, it needs to interact with CAD drawing. All design modules are available in myESCP. In comes with comprehensive report in EXCEL look alike. It covers topic of Chapter 12 Erosion and Sediment Control Plan of sediment basin. It suitable for user who just need to design sediment basin. It comes with 3D and with report in EXCEL format. It covers chapter 13 pavement drainage design. Four modules included. Uniform gutter, Composite gutter, V shaped roadside gutter. It covers chapter 14 Drains Swales. It is a networks design where it needs CAD drawing to work out. It covers chapter 15 Pipe Drains. It is a networks design where it needs CAD drawing to work out. It covers chapter 16 and 17 Engineered Channel and BioEngineered Channel. It most suitable to use it to prepare the main drain design in engineering works. The iteractive channel construction make user can build the shape that user need it. It covers minor drainage system in design. It covers chapter 18 Culvert. It is replacement of monograph design by formulae where the monograph derived from. It covers chapter 19 Pump. It is construciton of pump system. A design module is given here with follow the working example in MSMA. It covers chapter 20 Hydraulic Structures. It includes the energy dissipators with riprap basin, Stilling basin SAF and Stilling basin Type IV. A drop structure by spillway is given here. 3D visualization is available. These modules can provide user an insight of clearview of how MSMA contents were being presented. User can has the logic behind the sceen where user can know how it works. Furthermore, it not like attending course; it can re-use further on user design, coursework or any studies. 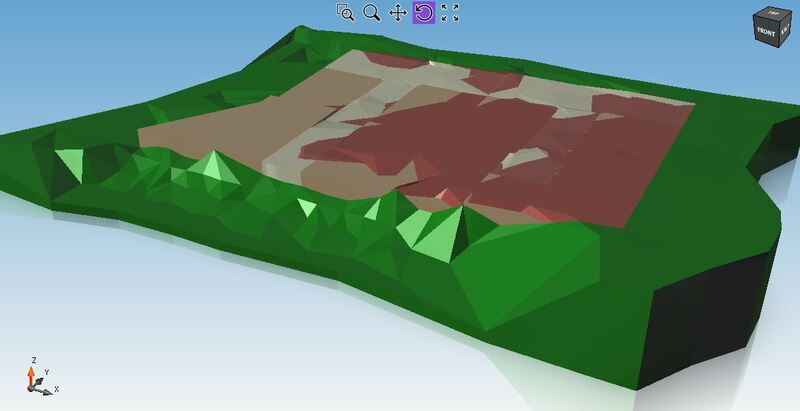 Our 3D Earthworks is an essential task to be carried out in any development project. During the earthwork, it will involving on soil movement. Therefore, it is a need to incorporate the ESCP together with earthworks. As a result, we have come out a package which tackle on these matters. ⇒ Storm+-Step by step design detention basin. The important of programming has been ignored by engineers all the time. They not aware of programming that can help a lot in daily engineering works. The Earthworks with ESCP also provide clue on design earthworks with ESCP. How to do a good earthworks design? Design of ESCP, what elements need to be attended? ⇒ 27/9/17 Programming for Engineers at IEM Pahang. Now is the perfect time to make the switch to ZEON EARTH Software and myESCP Software. Have a question, comment, concern, or compliment? Call (606-775 7307) or email sales@civilstructural.com.my.